Kathleen and Matthew Palmer adopted sisters Lizzy (pictured left) and Emily through UMFS 12 years ago. 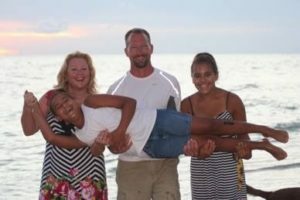 This is Kathleen’s second guest blog post for UMFS, and we’re grateful for such a personal firsthand account of adoption. I have struggled with this blog more than any other I have ever written. Trying to summarize the past 12 years of our adoption journey was a daunting task. It has been an amazing, life changing adventure and I hope sharing a bit of our experiences will encourage someone else to take the same journey. It is not a journey for the weak at heart. It is not a journey with a final destination. It is a journey of growth, and unconditional love. It is a journey of honeymoons, hiccups, and most of all…. It is a journey of HOPE! We began our journey in 2006 with foster parent training from an amazing UMFS staff in Annandale VA. The 6-8 months of training gave us the foundation of knowledge and coupled with our foundation in faith, we were able to create our family from a strong base. It is a base we return to again and again when need strength, information, advice, and support. There is much research on the first phase of adoption called ‘The Honeymoon phase”. This phrase is mainly used when describing adoptions of older children from foster care who have experienced severe trauma in their lives. When first adopted, many of the kids are on their best behavior while they are taking in their new situations. We learned about this phase in our training and our girls were no different. They were watching for signs that we could be trusted and also worried that we would be like the last foster family they had experienced who delivered empty promises. We didn’t blame them. How could they think any differently? We even heard the older one chastise the younger one for acting out during one of our early days . She pulled her aside and in her toughest 10 year old voice, told her “Stop acting like this, you will ruin it for us.” At that point, I finally got it. One was afraid to be taken away, and the other was beginning to feel comfortable enough to give us her pain. It really was an important realization to make early in our journey. The oldest continued to push down so much pain to be the “perfectly adjusted” child. It was tempting to take credit for her outward ability to transition and adapt, but it really meant she was afraid to act out and lose our love. The youngest, on the other hand, broke boundaries very early. The honeymoon phase with them was very short and that was okay. Although we would have enjoyed more of the ease of the honeymoon, the end of it meant things were falling into place. We were being trusted with their pain and their needs. That was a huge step. Thus began our journey with two totally different kids reacting to the same trauma in two totally different ways. All parents experience “hiccups’ in raising kids and we were no exception. The girls struggled with normal things such as making friends and doing chores, but there were some unique situations that foster/adoptive parents often face. School assignments such as creating family trees and researching ancestor heritage filled both the girls (and us) with dread and anxiety. These types of assignments usually sent the younger one into tantrums and anguish while the older one wanted to immerse herself into our heritage with gusto. There is nothing like watching your adopted daughter with obvious Mexican heritage tell her 5th grade class about her great, great grandmother’s survival the potato famine in Ireland. Meanwhile the youngest tore her family tree into a million pieces. These were the first of many ‘hiccups” we experienced. When we moved to Texas nine months after adopting the girls, I thought that the military lifestyle was going to be so amazing for them. Think of all the people they would meet and places they would visit. Dr Seuss’s book “Oh the Places You Will Go” played in my head. It would be awesome! But deep down their pain of loss and mistrust lingered. Fortunately, the state of Texas was big enough to hold all their pain and in the two years of our assignment there, the girls began to trust us and find their own voices. We told them to try everything and we kept our promise to support all their interests. The girls tried swimming, gymnastics, music, sports of every kind. We never said no to an activity flyer they brought home, a sports camp, or a music lesson. We never minded driving them to an activity. After all, they had spent so much of their lives just surviving, they had no idea how to thrive. We told them we were putting them first, and it was time for them to think about their interests. The older one (Emily) found her passion in cheer leading and with it, a strong sense of belonging and fitting in that she so craved. She had never gotten to belong to any after school activities before, and I will never forget the joy on her face as she tried on her first cheer uniform or the enthusiasm she cheered with at every game. The younger (Lizzy) found a gift for music and began taking piano lessons as well as playing basketball. We are grateful to the teacher that discovered this gift as the piano has provided Liz with an emotional outlet as well as a talent she continues to nurture. I cried at her first recital, and I still cry at every one of performances. They both began to develop more confidence and became less anxious with each passing day. One of the biggest hurdles for us (raising Emily and Lizzy) has been the constant military moves and deployments. But after a while the girls realized that although our zip code may be constantly changing, we are all moving together. At every new place, we unpacked and set up their rooms first so everything would seem familiar. No matter where we moved, they jumped right in and took on each new place with the bravery that has fueled them throughout most of their lives. 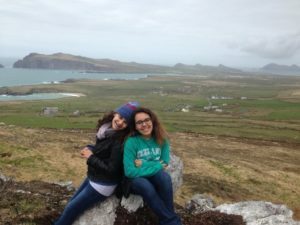 As the girls approached the middle and high school years, they had normal setbacks and challenges coupled with multiple school changes and puberty. AS with most parents of teenagers, we took them one day at a time. Emily cheered her way through most of high school and by her senior year, she was starting her third and final high school. By this time, she had learned to drive, had a job and spent much of her senior year getting ready for college. Emily won a scholarship from Fairfax county school District for her “Overcoming Adversity” essay. The day she accepted that award still brings a smile to my face. Almost all of our extended family attended that ceremony. She was accepted to three universities: Northwestern State in Louisiana, Stephen F Austin in Texas and Sam Houston State. She attended SHSU for 2 years before deciding to enlist in the army to become a medic. We are proud that she not only got into college, but that she is also serving her country. Lizzy found herself following the music into high school as she participated in marching band and piano recitals. 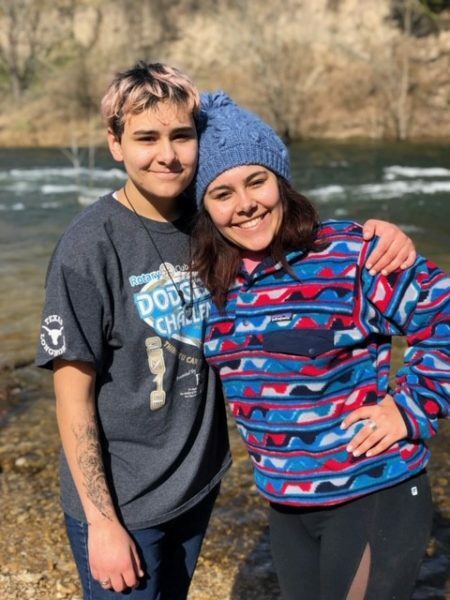 She struggled a bit with balancing her past and her future, but with a lot of love, patience, and HOPE, she is finishing high school on the honor roll and looking to attend culinary or music programs after she graduates in 2020. She has not had an easy road, and through a great counseling and therapeutic program, she is now thriving. She inspires us with her ability to work hard on her personal struggles, and she is so protective of her sister and the rest of us. As the years progressed the girls began to love us in their own ways and have accepted our extended families as their own. We still treat birthdays and holidays as gentle celebrations that can go north or south depending on the year. It is a time to celebrate but also a reminder of past celebrations without us and a reminder that they come from somewhere else, a place where they had birthdays and holidays without us, and other people filled our spaces. We are painfully aware of this fact. Another tough area is the “gotcha” day. For a long time, one wanted to celebrate and the other wanted to mourn. The hardest part of adoption is managing expectations, mostly our own. We wanted to shout from the rooftops every Nov 4th that God blessed us with these two amazing souls. But we also know that our blessing came from a loss; a place of chaos and grief. By adopting them, we brought them from that place of grief to new places to grow and heal. We brought them to TX and Maine and gave them ten cousins, four aunts and five uncles. We brought them to NC, DC, and KS and gave them a view of America seen by few. And in turn they showed us many things as well. They showed us how to love unconditionally. They showed us how to put pride on the back burner. They showed us how to love through pain and how to not take anger and frustration personally. They showed us that there can be JOY in the suffering and lessons in the pain. They showed us that HOPE is the best tour guide on any journey! I would have given them time! Time to work through all their fears, instead of watching them try to keep up with their peers weighed down by their pain. I know some of you reading this may just be starting out in your adoption or foster care journey, or be in the middle of a honeymoon period, or even mired in pain right now. Have Hope! It will be okay! Your kids will turn out how they are supposed to be! I love the people my girls are turning out to be. Their pain is a part of them, and they found a way to weave it into who they are. You can read more of Kathleen’s work by clicking here.